This great movie is based on historic tale of king Leonidas who together with 300 Spartan soldiers managed to hold off, at least for some time , vastly overpowering enemy. Enemy being Persian king Xerxes and his great army. This story being old as Greece itself was clear basis but then we have Frank Millers graphic novel and also remembering movie that came out in 1962 named The 300 Spartans there is pretty obvious where writter and director Zack Snyder together with co-author Kurt Johnstad got his inspiration. On subject of movie 300, story is completely irrelevant, action, action and some motivational speeches from king himself are well worth few hours of fun. Special effects play important role in this movie but not kind of effects that take away viewer from movie. All camera work and incorporation of effect is brilliant. Gerard Butler as king Leonidas, Lena Headey, David Wenham and whole cast were also major contributor in success of this great work. If you want example how to transform graphic novell based on historical event into major motion picture look no further. Beside all genius stuff with camera and acting did i mention lots of fun. I strongly reccomend 300. First see version from 1962 to get some sense of reality and then this mind blowing 2006 version. Finish it all of with next movie in our database which is parody on 300. 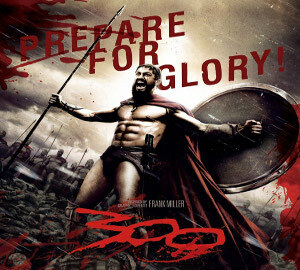 In any case Spartans, prepare for glory, tonight, we dine in hell ! anonymous: "This is nice title to watch. Wonder why it has acchieved such poor ratings. Probably due difficult title in web seo sense. I mean series Life was hard to find because it is so common word, imagine how hard is to stand out of all those other occurrences of number three hundred on internet." George Martin Jr: "My name is George, and I was wondering if you would like to have your website sparot.com promoted as a resource on my blog georgemartjr.com ? " Solve this complex math: 9 + 2 = ?